Our Gyapa™ stove is an improved cookstove that uses up to 50% less charcoal in comparison to a traditional stove. Through the production, distribution and use of this product we have been able to make a significant impact on Ghanaian livelihoods. In 2012 the average household saved $95 directly from the reduction in household charcoal consumption. Commercial users saved $440 from using less charcoal. This resulted in a savings of over $11 million for Gyapa users across Ghana. Our customers have been able to spend the money they have saved on such necessities as rent, health care and school fees. Deforestation is a major global issue, Ghana's deforestation rate between 2005 and 2010 was the 6th highest globally, at 1.64% per year. The crucial carbon sink that rainforests act as is lost through the act of deforestation, it is estimated that healthy forests have the ability to absorb 15% of man-made carbon emissions and it is calculated that deforestation and degradation of rainforests attribute to around 20% of all carbon emissions. Due to the reduced consumption of charcoal through using Gyapa™ stoves our customers have helped slowed deforestation rates, as well as reduce carbon emissions. 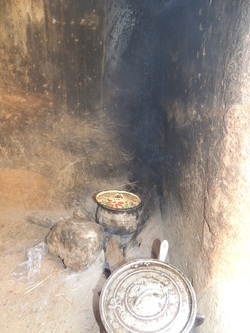 The everyday task of cooking can be a very hazardous chore for those using traditional cooking methods, with both household air pollution and burns having a considerable effect on Ghanaian life. According to WHO's 2004 estimate, nearly 11 million people per year are burned severely enough to require medical attention. In a publication released in March 2013 entitled ReThink Burns, it is estimated that infants in Africa are burned to death at 3 times the worldwide rate, 95% of all burns victims are in developing countries. A key factor in the incidence of burns in the home is cooking appliance safety and the potential for young children to tip over the stove. The Gyapa™ stove is built with a wide base, which is not only conducive to the cultural style of cooking, but is also weighted to be difficult to tip over. Watch the award winning 'Black Inside - Three Women's Voices' produced by the Global Alliance for Clean Cookstoves to hear from women who used traditional cookstoves and how they are benefiting from an improved cookstove. ~ from Rodney Rascona on Vimeo.